“…your music suited the atmosphere perfectly and many of our family and friends have commented on how wonderful the you were…thanks for a superb performance”. Looking For a Solo Guitarist in Scotland? Are you looking for a solo guitarist for a wedding or event in Scotland – then consider have one of Scotland’s most accomplished solo guitarists to perform his specially selected repertoire which is sure to help to make your event unique and memorable. 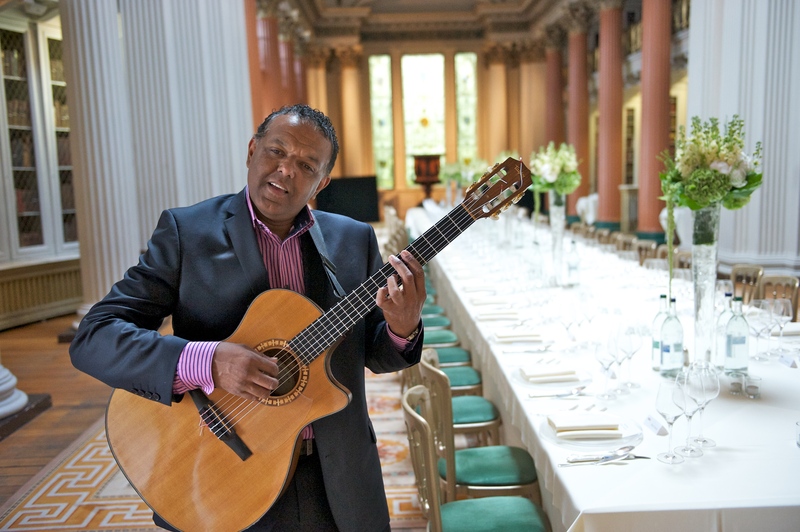 He has played at some of the most prestigious venues in Scotland including Edinburgh and Stirling Castles, Hopetoun House, One Devonshire Gardens, Balbirnie House, Former Royal Yacht Britannia, The Balmoral and Gleneagles Hotel. Internationally he has performed in Italy, Germany and four trips to China. Each year Marcus will perform at many weddings playing solo guitar. The popularity of the guitar makes it the perfect wedding ceremony and reception instrument, atmospheric and romantic it creates the perfect ambiance for a wedding in Scotland. The equipment used is discreet and highly flexible meaning he is able to switch between rooms for example following on from the ceremony within no time at all he can be set up and playing over the drinks reception if required. A typical booking scenario for a wedding ceremony can involve music before the vows, drinks afterwards and/or the breakfast.. Even music for the walk down the aisle can be included. Marcus will be happy to discuss this with clients to ensure that personal tastes and wishes are catered for in planning stages. In addition to the often asked for wedding tunes such “Air on a G String,” “Ave Maria,” and ” Pachelbel’s Canon in D”, Marcus has put together a repertoire that includes well known classic songs ranging from “Unchained Melody” “What A Wonderful World” “Mona Lisa” “Someone To Watch Over Me” “Fly Me To The Moon” to Beatles classics such as “If I Fell” “Michelle” “Norwegian Wood” and “Here There And Everywhere”. A set list with variety sure to please most tastes! Take a look at this set list which highlights just a few of the many songs Marcus Ford is able to play. If there is something that you would especially like played please ask as this may be something Marcus can perform for you and your guests with notice. For some events Marcus performs solo guitar pieces and then is joined later by his group Ritz Trio. This professional trio are much sought after for stylish weddings and corporate events in Glasgow, Edinburgh, Aberdeen and further afield. The band are regularly called on to provide their sophisticated music at prestigious venues in Scotland and can often be seen at weddings, corporate events and functions at Edinburgh Castle, Skibo Castle, Gleneagles Hotel, Balbirnie House, The Old Course Hotel, Balmoral Hotel, Hopetoun House, Norton House and Duns Castle to name but a few! 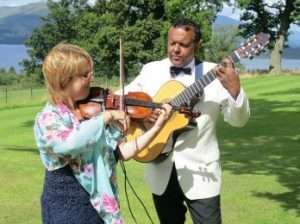 Marcus also plays alongside his wife, Trudie Ford, and working together for over twenty years, they offer a wide variety of musical styles including classical, jazz and modern popular, which creates the perfect background ambiance for weddings. Ideal to keep your guests entertained before, during and after the wedding ceremony, their versatility means they are easily able to move between the ceremony and reception location. Looking through a selection from their set list, you are sure to find something to cater for most tastes. Trudie is also a pianist and can accompany hymns if being used in the ceremony.